The hotel is in Langada close to where our operation is based. It is a family owned hotel, with a wonderful warm and friendly atmosphere set in this small and beautiful hill village away from the road. It has 19 rooms of varying sizes but most clients elect to stay in the large studio en-suite rooms with air conditioning, fridges, telephone and a small kitchen. All of these rooms have a balcony looking over the olive groves down to the sea. From this vantage point you can sit and watch the red sunset behind the mystical uninhabited island of Nikouria opposite. People who have travelled the Greek islands extensively have told us that this is their favourite spot in the whole of Greece. From the hotel you will see the villagers going about in their daily routine on their donkeys up and down the village steps greeting and chatting to everyone as they pass. 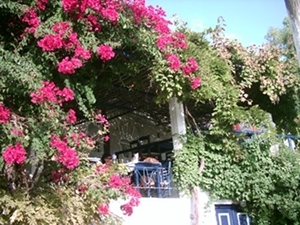 The hotel and village is a mass of colour with flowering bougainvillea, wisteria and jasmine. You can hear the donkeys braying in the fields and the singing cicadas in the olive groves beneath your balcony. The restaurant is in a taverna style where you can sit on the wide veranda shaded from the sun by dense grape vines and wisteria or inside surrounded by old family photographs and antiques. The food in this establishment is renowned on the island, Nikos, the owner, insists on knowing the precise origin of all ingredients and most of the food is organic much being grown on the island. The choice of dishes is wide. You can enjoy fresh goat meat from the grill, village cheese from goat milk prepared in the traditional way on top of a wood fire, local olive oil and wines. In the mornings you can smell the jasmine and the fresh bread coming out of the baker's oven next door, which is also owned by the family. 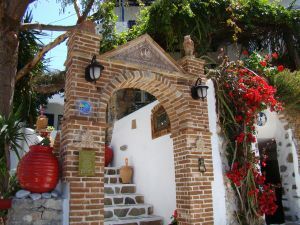 Outside the taverna is a popular meeting place where the old men gather drinking coffee and putting the world to rights or playing tavli and the ladies pick over olives or vine leaves in big bowls on the steps making preparations for your dinner. This location is very peaceful but also be ready for local musicians and lots of dancing some evenings. These impromptu little parties are just a part of the real old fashioned Greece that you will experience on this programme. Breakfast, and dinner or lunch, your choice each day, is included in the package on the island. You may however wish to walk up to the little village square where there are a few more tavernas. Traditionally the tavernas do not have menus, you are encouraged to go around the kitchens and choose your fish from the fridge or a dish from the oven. Dinner for two including wine is excellent value for money. 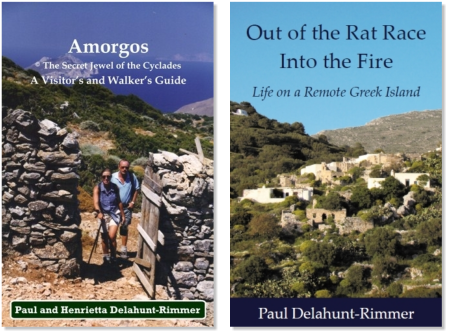 If you wish to venture further a field you can walk down the old paved donkey track to the port of Ormos where there are a few more establishments to dine. Ormos also boasts the very best long sandy beach on the island with clear blue water. This delightful walk through the olive groves takes just 25 minutes or there is a regular and reliable bus service. On guided walk days Paul and Henri ensure that swimming is made available to you every day as part of the programme. Those clients on special interest programmes may coordinate with their visiting "expert" to finish the day down on the beach if they wish.